Arturo Vidal (Chile) is awarded a yellow card for his behaviour. The attendance for today's match is 18033. Reinaldo Rueda Rivera has decided to introduce fresh legs, with Jimmy Antonio Martinez (Chile) replacing Aranguiz. The referee points to the corner flag. It's a corner to Chile. Diego Rubio (Chile) meets a cross inside the box, but Ethan Horvath wins the battle for the ball and the chance is gone. Substitution. Nicolas Castillo makes way for Diego Rubio (Chile). Sebastian Vegas (Chile) is yellow-carded for breaking the rules of the game. Gregg Berhalter prepares a substitution. Cristian Roldan is replaced by Jonathan Lewis (USA). A cross into the box from Arturo Vidal (Chile) is cleared. The substitution is prepared. Jordan Morris (USA) joins the action as a substitute, replacing Gyasi Zardes. The ball goes out of play and Chile have been awarded a corner kick. The Chile players are exchanging some short passes. Daniel Lovitz (USA) gets a yellow card. Daniel Lovitz (USA) tries to latch onto a through ball, but it's too long. We are about to witness a subsitution. Sebastian Vegas (Chile) for Guillermo Maripan. Reinaldo Rueda Rivera decides to make a substitution. Diego Alfonso Valdes Contreras will be replaced by Erick Pulgar (Chile). Guillermo Maripan (Chile) is clearly asking for some medical attention with his painful gestures. The extent of his injury is yet to be discovered. Guillermo Maripan (Chile) is penalised after knocking an opponent down. The referee stops play so that a substitution can be made and Wil Trapp (USA) replaces Paul Arriola. USA will take a corner kick. Daniel Lovitz (USA) crosses into the box from near the side line, but he doesn't connect as he wanted and it's cleared by the well-organized defence. Guillermo Maripan (Chile) is obviously not following the Golden Rule: „Treat others as you want to be treated.“ He makes a bad challenge and leaves Daneon Parchment with no other option than to blow for a foul. Nicolas Castillo (Chile) is picked out by one of his teammates with a great cross, but his poor control allows the defence to clear and avert the threat. Gregg Berhalter has decided to substitute Corey Baird and he is replaced by Daniel Lovitz (USA). Gyasi Zardes (USA) misses a sitter as his shot goes over the bar. What a great touch by Nicolas Castillo (Chile) as he controls a fine pass into the box and takes a shot to the centre of the goal, but an opposing player makes a clearance. Great defending. Gary Medel (Chile) sends a long ball across the pitch, but it misses its target. Oscar Mauricio Opazo Lara (Chile) sends over a cross, but he can't find any teammate inside the box. Poor delivery. Oscar Mauricio Opazo Lara (Chile) squandered a huge opportunity from inside the 6-yard box. He blazed it high over the bar. Corey Baird (USA) produces a good strike that sails to the bottom right corner, but the goalkeeper shows great reflexes and dives to keep the effort from hitting the net. There will be nothing more to see in the first half. The whistle blowing of Daneon Parchment has ended it. A long cross from the side is directed to the well-positioned Corey Baird (USA), but the defence gets it clear. Arturo Vidal (Chile) attempts to find some of his teammates with a dangerous pass from the edge of the box. The opponent's defence, however, intercepts the effort and clears the ball to safety. Nicolas Castillo (Chile) unleashes a shot from the edge of the box, but it goes straight at Ethan Horvath. Arturo Vidal (Chile) has a crack at goal from the edge of the box, but it drifts high over the bar to safety. Arturo Vidal (Chile) produces a lovely chip pass into the box, but one of the opposition players cuts it out. Nicolas Castillo (Chile) is offside and the linesman raises his flag. Substitution. Sebastian Lletget (USA) replaces Christian Pulisic. Christian Pulisic (USA) requires medical treatment, so the referee stops play and signals for the physio to come onto the pitch. Christian Pulisic (USA) is penalised for holding. Daneon Parchment signals a set piece. USA force their opponents to concede a corner. Paul Arriola (USA) sends a teasing cross into the area, but Gabriel Arias intercepts the ball. Mauricio Isla (Chile) is forced to stop his attacking move after the linesman signals for offside. Chile seem to be finding their feet as they enjoy some possession. They are waiting for the right moment to create new attacking opportunities. Esteban Pavez (Chile) is rightly booked by the referee because it could not have been anything other than a yellow card. Diego Alfonso Valdes Contreras (Chile) lacks options so fires a shot at goal from the edge of box, but it's a wasted effort and goes high over the bar. The ball goes out for a corner. Chile can continue in their attacking effort. The game is interrupted. Guillermo Maripan (Chile) has violated the rules in the battle for the ball. No protests or gestures are being made as he is quite aware of what he did. Arturo Vidal (Chile) attempts to find one of his teammates with a fine lofted pass, but the defence reacts well to intercept the effort. Christian Pulisic (USA) sends a lofted cross into the penalty area. Unfortunately for him, the opponent's defence deals with his cross comfortably and intercepts it. A cross by Paul Arriola (USA) from the side of the pitch flies into the box, but fails to find its intended target as the aim was poor. Great teamplay by USA as they control the ball with a lot of short passes. Patience is the key if they want to find a gap in the defence to score. The linesman raises his flag. Corey Baird (USA) is adjudged offside. Christian Pulisic (USA) goes on a mazy run, skips past two defenders and pulls the trigger in front of the keeper. Gabriel Arias makes a decent save to deny his effort directed low to the middle of the target. 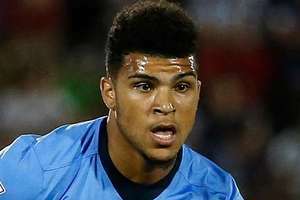 DeAndre Yedlin (USA) runs onto the ball and hits a thunderbolt of a shot at goal from the edge of the box, but sends it narrowly wide of the right post. Goal! Oscar Mauricio Opazo Lara (Chile) was in the right place at the right time to get to the rebound inside the box and gleefully rifles the ball into the right side of the goal. It's 1:1. Mauricio Isla (Chile) tries to pass the ball into the penalty area but it's blocked. Arturo Vidal (Chile) bursts pass a defender and attempts to score from the edge of the area, but the shot goes high over the bar. GOAL! Christian Pulisic (USA) collects a pass and from inside the box he lifts the ball over Gabriel Arias, who was off his line. What a finish that is! 1:0. A promising cross into the box is nearly received by the lurking Cristian Roldan (USA), but one of the defending players cuts it out to avert the threat. Mauricio Isla (Chile) does his best to latch onto a cross into the box, but he can't get to the ball. The players are out at last! USA will take the kick-off. Daneon Parchment got the nomination for today's game and will try his best to be a fair judge and not make any mistakes.